The cottage with the :"WOW" factor! Black Cat Cottage has been built to cater for International tourists and Kiwis alike. Priced to appeal to families, or couples. Ideal for those wanting time out. Located 8 minutes north of Kerikeri, and set well back from the highway in beautiful gardens. The cottage faces north, with an outdoor patio, gas BBQ and dining for 6 people. It has double glazing. There is a large screened spa pool. Two bedrooms, with a queen bed in the main bedroom, and twin singles, which can become a super king bed in the second bedroom. The kitchen is well equiped and has a dishwasher, and gas hobs.There is a large fridge-freezer. Flat screen TV ( Sky) and a DVD + childrens videos for wet days. Linen provided, including spa /beach towels. If you are looking for a central location to explore this lovely area, then this is for you. You can hand feed the sheep, cows and donkeys. Trampoline, swing set, netball hoop and balls. Great value for couples or a family wanting a relaxing vacation. Email bookings answered same day. Central to all the 'top part' of this beautiful area. A mimium rate applies for up to 2 people, for the Summer, and other Peak holiday periods. The cottage sleeps up to 6 people. Please leave unit as you find it. The cottage is in a nice quiet country setting and is away from the main house so very private. The cottage is clean, has lots of room and the patio area is very good. Excellent base for touring north island. The donkeys and ducks on the property are very fun and made the visit extra special. Will be back our next trip. We had great weekend next to the friendly animals. Black cat cottage was comfortable, tidy and well equipped with everything you would want for your stay. The owners were friendly and helpful. We would recommend it to other families. Helen and her family were excellent guests. They left the cottage clean and tidy which we appreciate. Would highly recommend them . 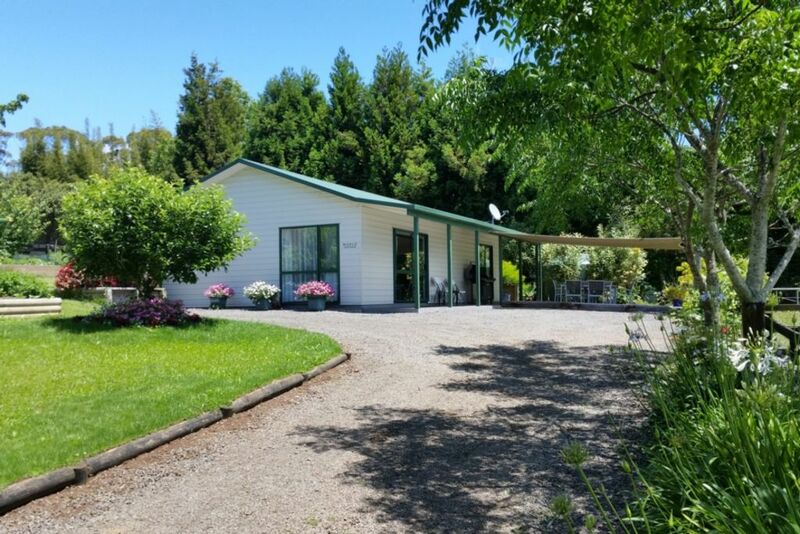 Lovely rural setting minutes drive to Waipapa, Kerikeri and local Bay of Islands attractions. Spacious, well appointed accommodation with loads of thoughtful touches for visitors. Beautiful well tended garden was a bonus. Black Cat Cottage was nice and modern and an absolute bonus was how beautifully warm it was. Location was perfect, close enough to all the attractions but far enough to feel secluded and away from the hustle and bustle of town. Loved the spa under the stars.